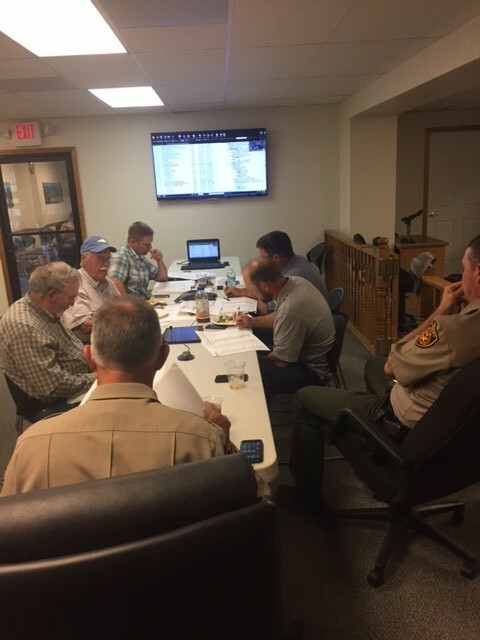 Pre-construction and design meetings continue for the new Crook County Jail Construction Project. Pictured are Kirby Nagelhout Construction Company team leaders, Brian Powell, Dan Hopper and Tyson Milliron. Also Pictured is Sheriff John Gautney and Undersheriff James Savage as well as Crook County Commissioner Brian Barney and Owners Representative, Jerry Milstead. The team was also joined by the City of Prineville Street Officials during a site walk of the construction location near the existing Sheriff’s Office. Work is scheduled to begin this fall on the 75-bed jail that has been made possible by the passage of a November 2016 construction bond. The facility is being designed by DLR Group Architecture of Seattle Washington.